The concept I am suggesting is not a new revelation by a long shot, but it’s worthy of consideration for several reasons. First, there is the obvious savings. Typically, and prices and deals will vary everywhere, you can save at least fifty cents on the dollar per pound…sometimes more…sometimes less. 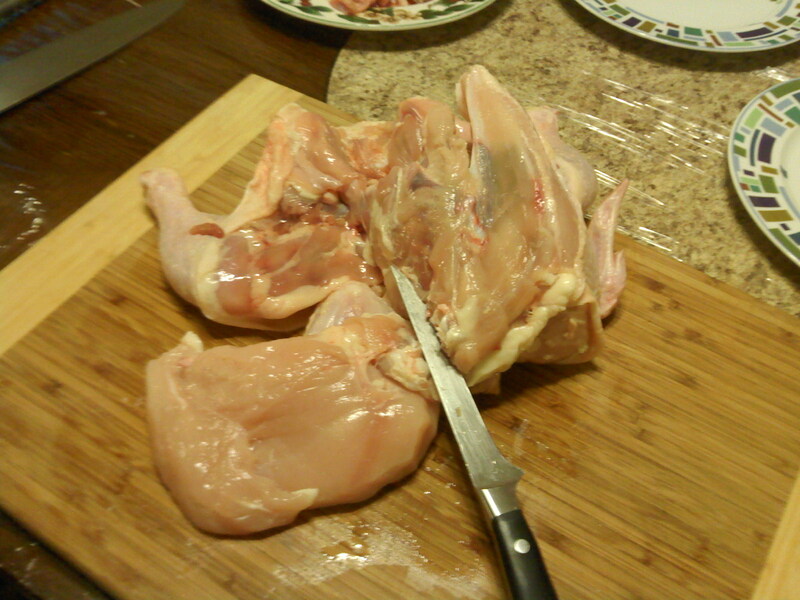 The next good reason is that with proper butchering techniques, you can allow yourself more options for meals or secondary ingredients for other dishes. Int he following pictures, I demonstrate with explanation a very basic break-down of a 7 lb. 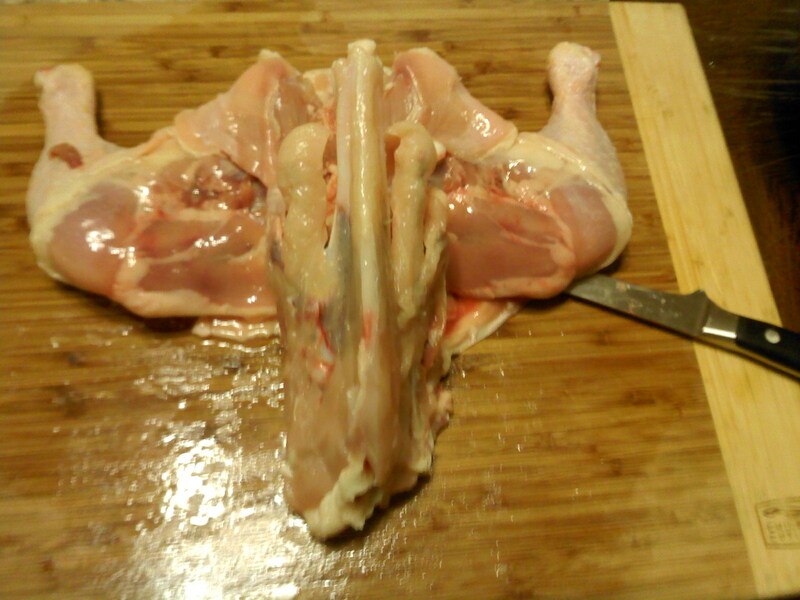 chicken into workable parts for three different applications. Top left: This shows where the lade finds the natural curve of the ribs removing the meat cleanly from the bone. 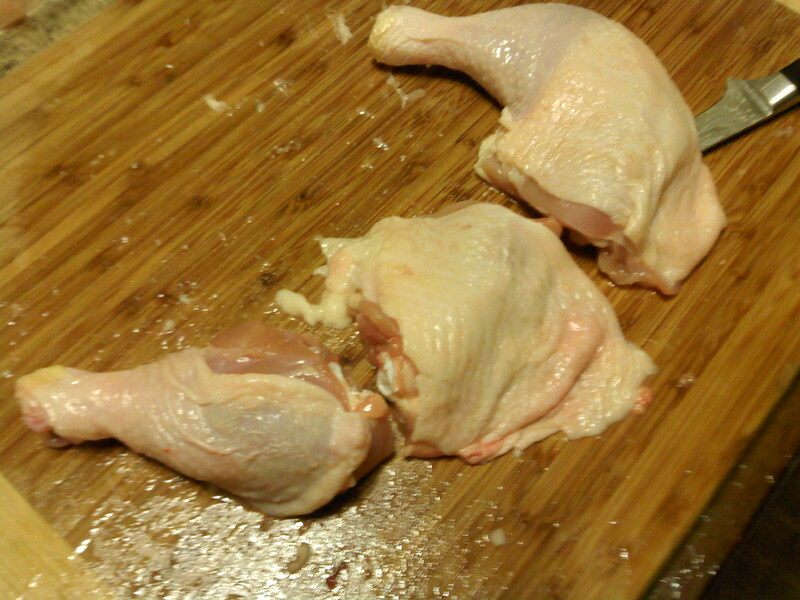 Top right: Here both breasts have been removed leaving the legs and thighs. 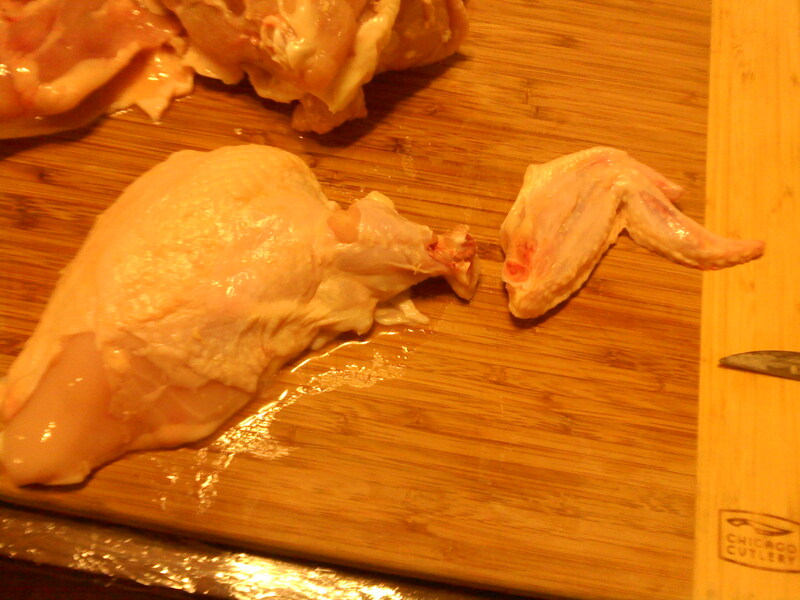 Notice how little meat is left behind. 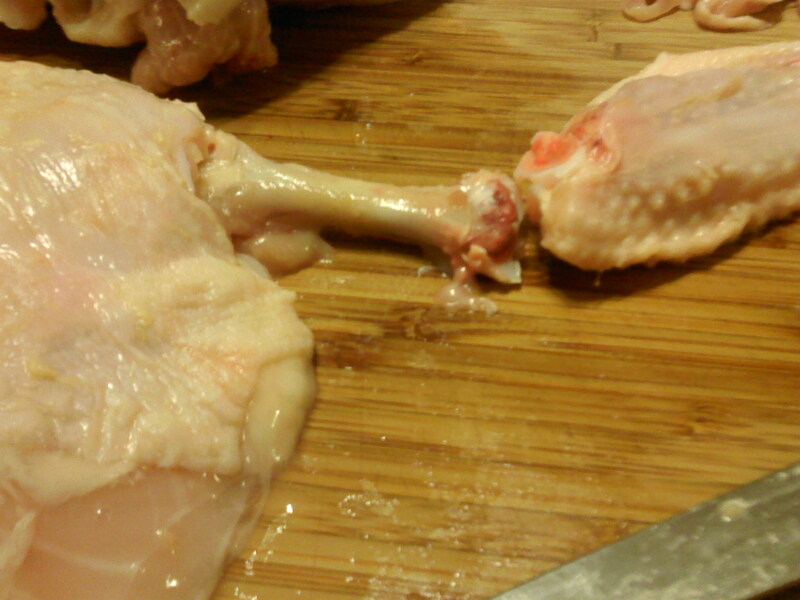 Bottom left: Here I have separated the leg from one thigh by simply “finding” the joint with the same 6″ inch boning knife. 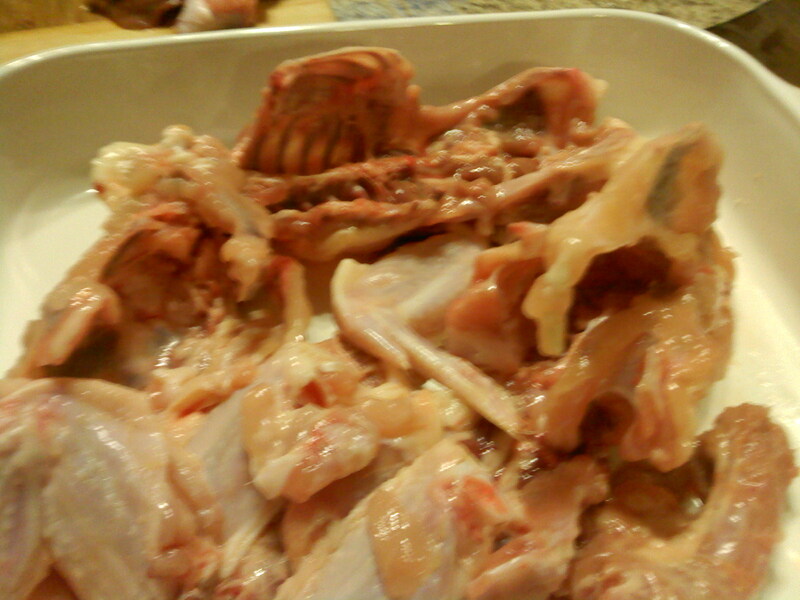 Bottom right: Bones and scrap destined for stock. 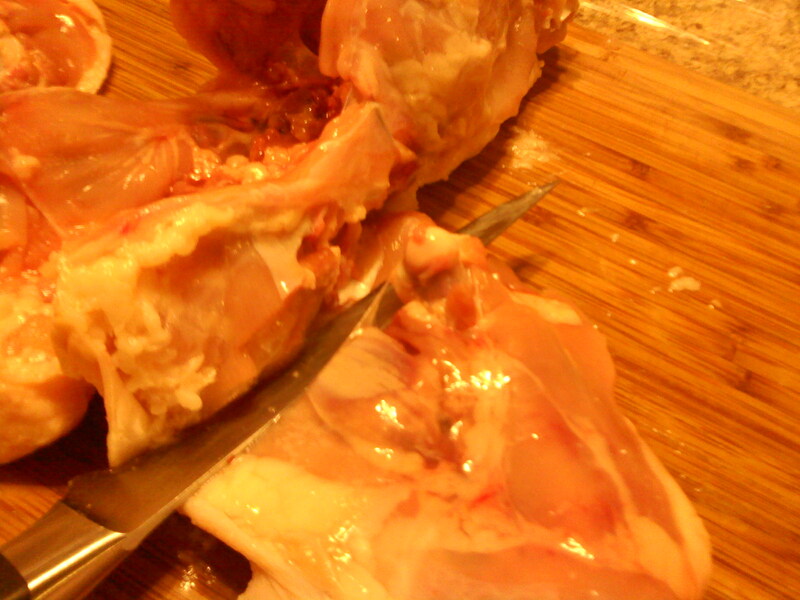 Usually I will roast the bones with a rough chopped mirepoix and make a nice roasted chicken stock. So far, not including the time for picture-taking and hand washing, this has taken me about four minutes. 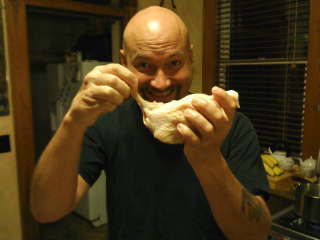 I can do this faster if say I had six cases of whole chickens to break down for a prep job in a professional kitchen. You will get faster the more you do it and it’s actually a bit therapeutic. 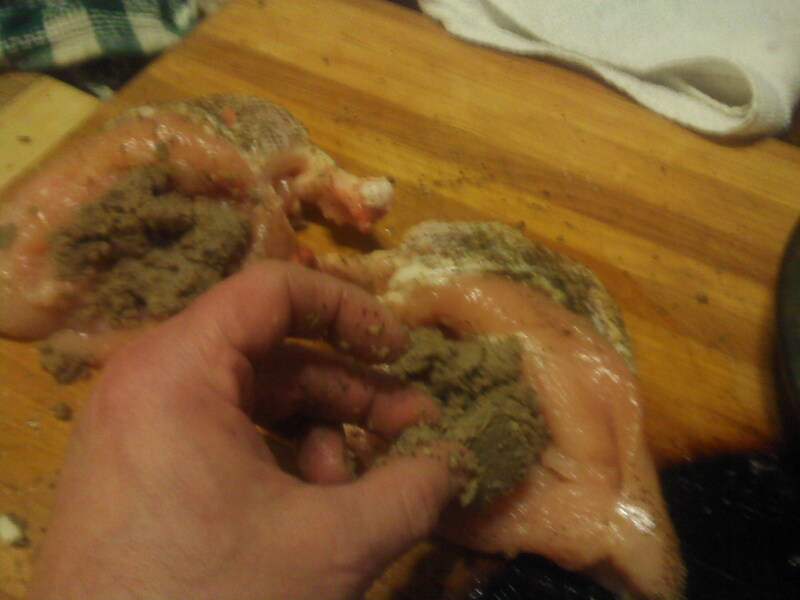 I decided for this session, I would stuff the breasts with a nice liver pate (…stay tuned for the pate post…there is a lot to it if you wish to follow the “old school” method…) that I had left over from a recent party, and saute the breasts and finish in the stock I have made, reduce and finish with whole butter. 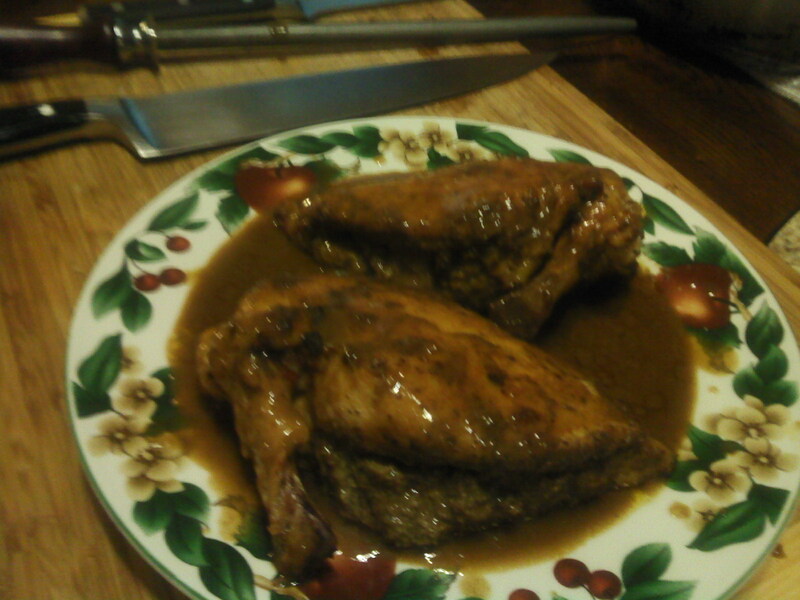 The legs and thighs, I braised in red wine and finished in a garlic tomato sauce like a cacciatore. And of course the bones and scrap went in the oven with carrots, onion, and celery for a nice roast and then to a stock for a later reduction. Top left and right: I have made a pocket with the tip of the boning knife and then stuffed the pocket with that delicious liver pate I had made. 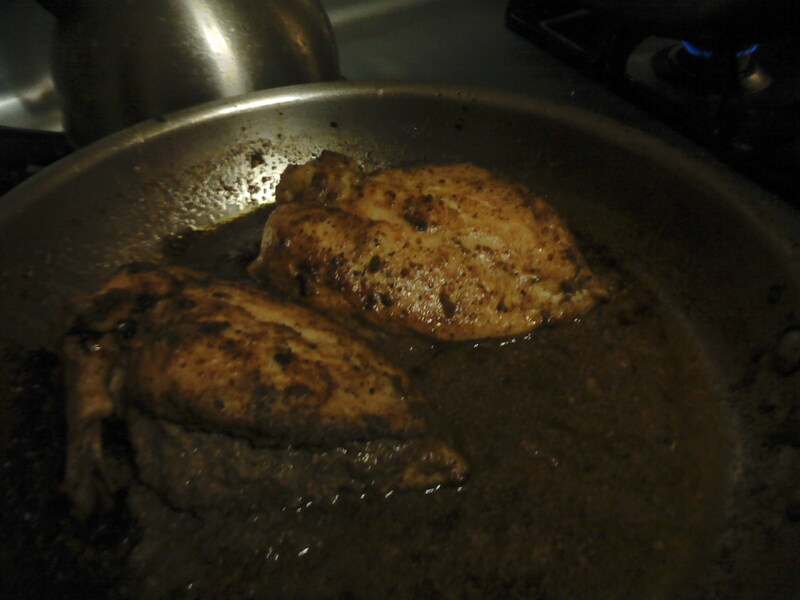 Bottom left: The “Frenched” breasts are stuffed, seasoned and ready for the saute. 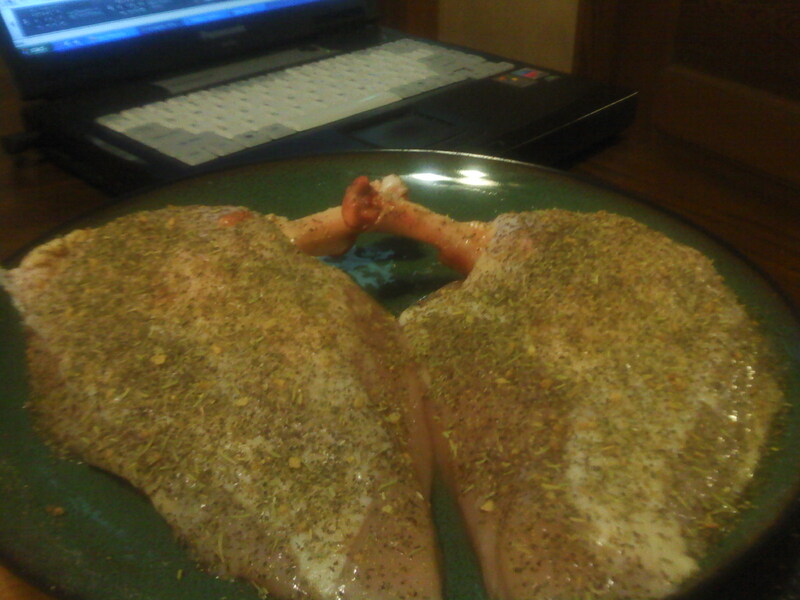 Bottom right: The breasts were started skin-side down in hot olive oil to create a crust with the herbs and salt and fresh cracked pepper I had seasoned them with. 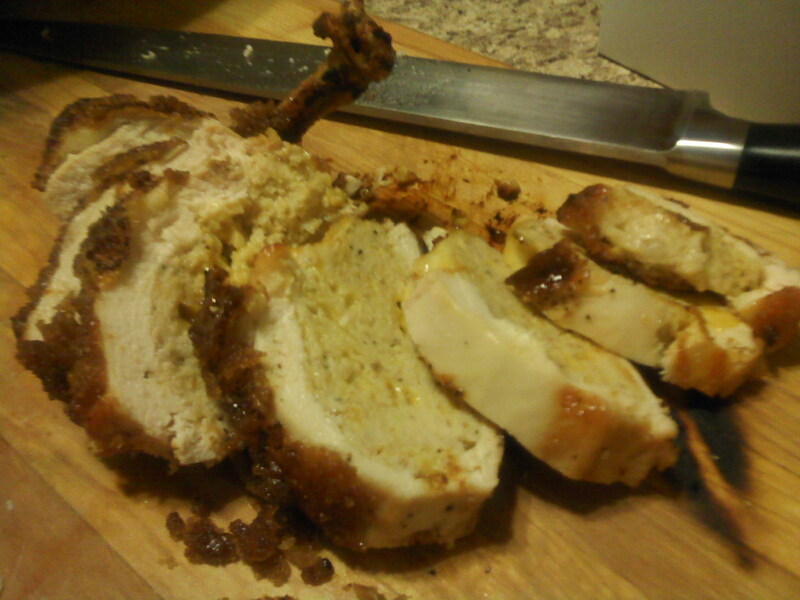 Then I deglazed the pan with white wine and finished with the roasted chicken stock and reduced and mounted with butter (…mounte au beurre, in French…). 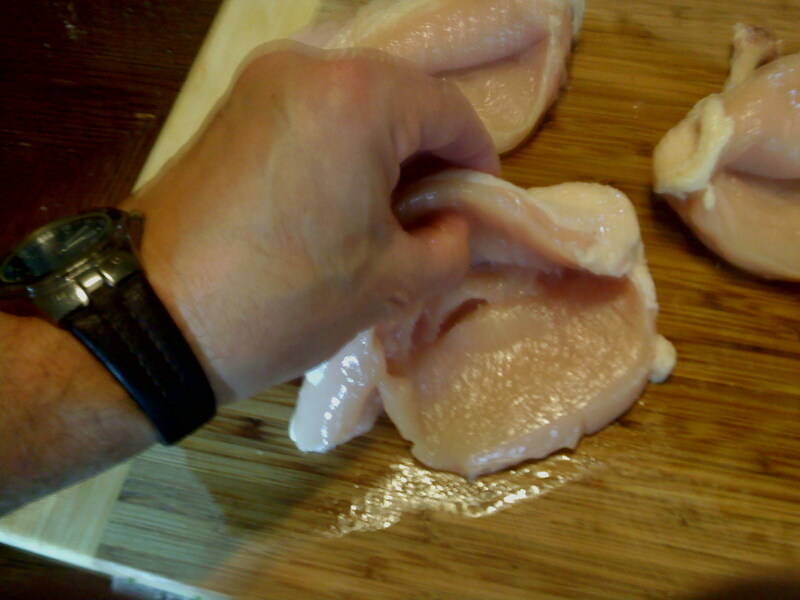 A few words about knives…I like to use a 6″ boning knife for butchering. It is flexible, sharp (…it better be sharp!…), and the tip can be used for finer detail work. I will use a 10″ chef’s knife if I have to do a lot of butchering like this just for speed and also for the finished slicing as you can see on the right. I will be doing a video on this when I when I launch my video log this coming August. In the meantime, if you happen to live in Toledo, I will be happy to offer personal home demonstrations as a part of my personal chef service. Feel free to hit me up with any questions about this you may have or just comments in general. I hope this was helpful, or at least fun to read! ← Stock 101-If You Love Food, You will Love This!